While flipping over the fabulously large and lustrous foliage of our potted Cardwell Lily out of curiosity, I discovered some plantlets growing beneath, hidden from view. How delightful as it gave me the opportunity to do something with them. You guessed right! …a chance to do a tutorial on how to propagate Proiphys amboinensis (botanical name) by division of young bulbs, especially for new gardeners who’d like to know or those interested. The tunicate bulbs of matured Proiphys amboinensis produce offsets easily as a means of multiplying themselves. The offsets or bulblets that develop from buds at the edge of the basal plate of the mother bulb will eventually produce roots and grow as new plants that can be used for propagation. Cardwell Lily or Northern Christmas Lily as commonly named can be propagated from seeds or by division of bulbs, the latter being the easiest and more reliable method. 1. Identify the young shoots that have emerged from the lateral offsets that you want to use for propagation. For success in propagation, it’s best that the leaves are about the size of the palm of your hand to ensure that the roots are already developed. One method is to dig out the whole clump of bulbs, that is, the mother plants and their young, and then separate the offsets and plant them to get new plants whilst the rest be repotted collectively or divided into smaller clumps. However I’d rather take the alternative route, by leaving untouched the mature plants that are thriving well and just remove the young plants from the large clump. 2. To remove the actively-growing offsets that have formed new plants, use a garden spade and carefully dig into the soil about a couple of inches away from the plantlets, around them and as deep as you visualize their offsets and roots will be located. Then shake them gently, by moving them back and forth in order to loosen and separate them easily. Once you feel that they are loosened, pull them upwards and out of the soil. 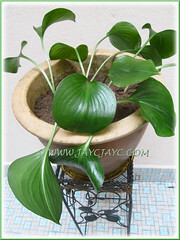 3.If you intend to replant the bulbs separately, prepare several pots, otherwise just a single medium-sized pot will do. 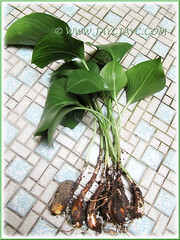 Fill the pot(s) with humus-enriched and well-drained garden soil. 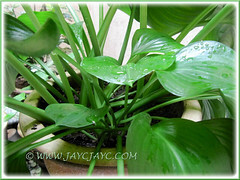 When planting, ensure that they are planted at the same depth previously seen. Water thoroughly through. Then locate it at a semi-shaded warm site. 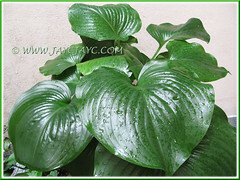 Remember to water them regularly, keeping them moist but not water-logged. The young plants will droop initially but when the roots are acclimatized over several weeks, the petioles holding the leaves will be naturally uplifted. That’s all to it. Guess what I’ve found when I checked our pot of young plants yesterday morning? 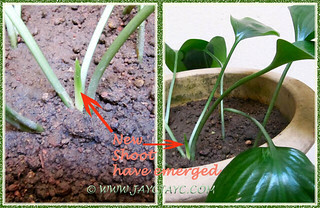 A shoot had emerged from one of the young bulbs replanted about a month ago! Yay, new growth… new growth! That sprout confirmed our success in propagating Cardwell Lily by division (separation) of offsets/bulblets. I noticed that you had well spaced out the plant instead of the usual crowded crown centre. I had seen this plant when I’m on the road – eyeing them when other gardeners leave them without care and they really suffer neglect. The pity part of it is that the crown eventually rot and the new shoots that comes out suffocate and choke as there is not enough soil for it to grow from it. Indeed, James… for optimum growth of young plants which will eventually fill out and form a gorgeous potted crowd. Thanks for dropping by and sharing your observations.